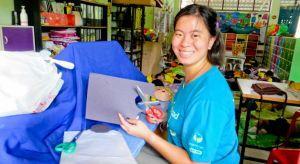 Newly graduated from high school and while waiting for college to start, Kelsey Quan (18) decided to come to Thailand to volunteer at Baan Nongkok School for four months. After spending time surfing the internet and looking for a program that would allow her to go abroad and volunteer, she found Projects Abroad and chose it because she liked the location in Thailand, the Care Project and the host family option. At the school, she taught the kids basic English and created fun activities for them. “In the mornings I played with the kids as they got dropped off, then I use flash cards to teach them basic English vocabulary. Every once in a while I lead an art project for the kids. At lunch time I helped serve the dishes and wash them afterwards,” said Kelsey on her responsibilities at her placement. While in Thailand, Kelsey stayed with a local host family and was able to learn some Thai from them. She learnt the Thai alphabet and some easy words for communication. Knowing some Thai words made it easier for her to control the class.